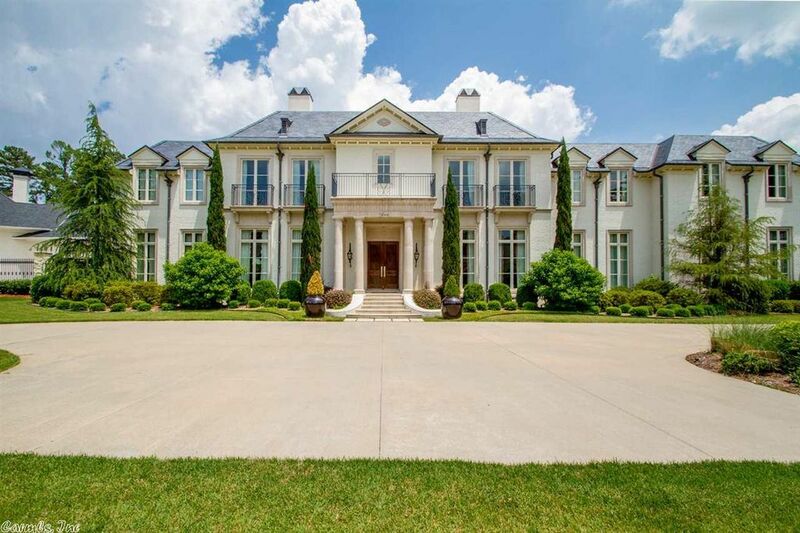 This brick and stone golf course mansion was once featured in At Home In Arkansas. It was built in 2011 and situated on 0.65 acres of land in Little Rock, AR. It features approximately 9,477 square feet of living space with five bedrooms, six full and two half bathrooms, two-story foyer/reception hall with floating staircase, formal living room, formal dining room with fireplace, butler's pantry, gourmet kitchen with Viking appliances, breakfast/sitting room with fireplace, family room with fireplace, wood paneled home office/library, loft, media room, wine cellar, garage parking for four cars, and much more. Outdoor features include a porte-cochere, motor court, covered front porch, roof top terrace, breezeway, loggia, BBQ kitchen, patio, and a swimming pool. 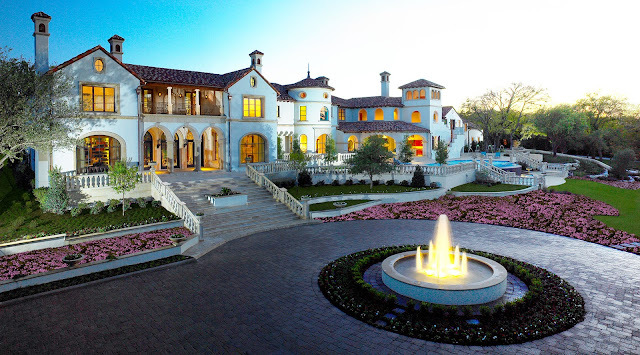 This stately stone mansion in Atlanta, GA was built in 2008 and is situated on 2.4 heavily wooded acres of land. The European-inspired residence features just under 15,000 square feet (approximately 14,965 square feet) of living space with six bedrooms, seven full and two half bathrooms, foyer and two-story stair hall with floating staircase, elevator, formal living room with fireplace, formal dining room, butler's pantry, gourmet kitchen with stainless steel appliances and breakfast area, family room with vaulted ceiling and floor-to-ceiling stone fireplace, wood-paneled home office with fireplace, a walk-out lower level that includes a recreation room, billiards room, wet bar, and exercise room. Garage parking for three cars is back on the main level. There is also an apartment/in-law suite. Outdoor features include a porte-cochere, motor court, front covered porch, rear deck, lower terrace with fireplace and BBQ station. 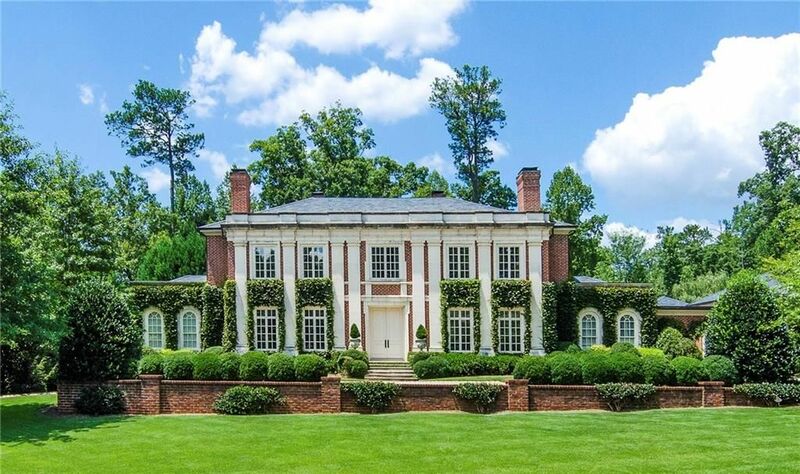 Dubbed 'Magnolia Hall Plantation', this modernized Colonial-style mansion in Fountain Inn, SC was built in 2012 and is situated on 50 acres of land. Boasting 12' ceiling throughout the first floor, it features approximately 14,000 square feet of living space with five bedrooms, seven full and two half bathrooms, foyer with staircase, elevator, formal living and dining rooms with fireplaces, chef-inspired kitchen with breakfast area and walk-in catering kitchen, family room with fireplace, library with floor-to-ceiling bookcases, an office/study room, lower level billiards room with wet bar, recreation room with fireplace, 10-seat home theater, an exercise room, and much more. Outdoor features include double wrap-around cover porch, lower covered porch, and a detached six-car garage. 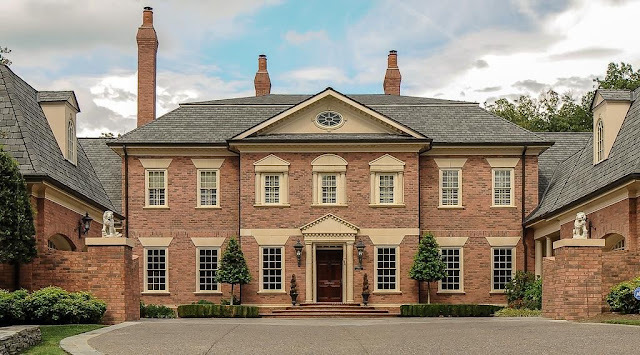 Built in 2005 and situated on two acres of land, this Harrison Design-designed colonial-style brick mega mansion was built in 2005 and features 23,700 square feet of living space. 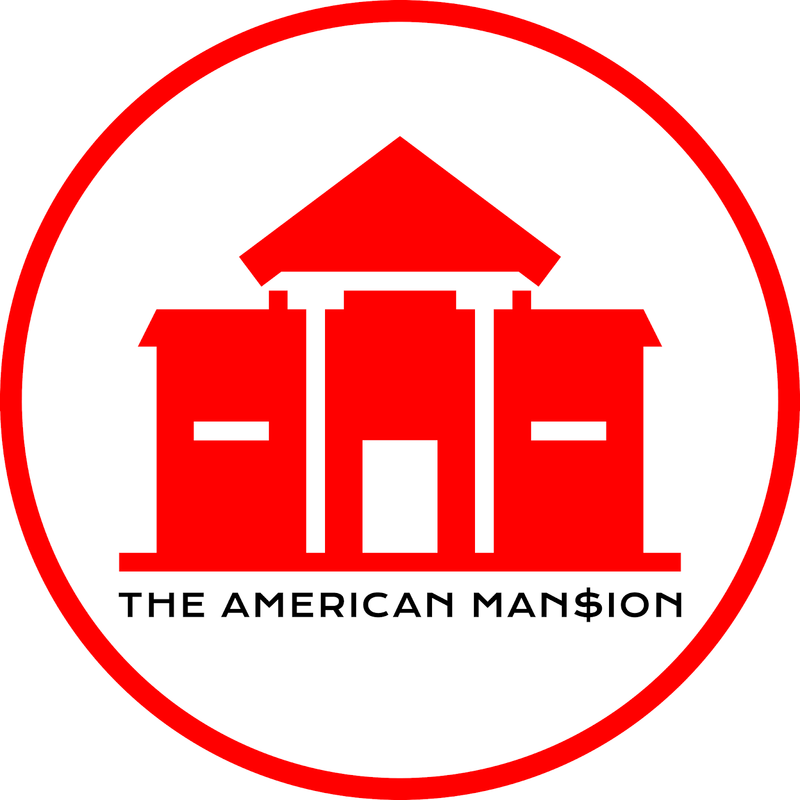 It has six bedrooms, eight full and two half bathrooms, two-story foyer with floating double staircase and gold-plated dome ceiling, elevator, two-story great room with 1300 gallon aquarium and gold-plated dome ceiling, formal dining room, butler's pantry, gourmet kitchen with double islands, breakfast room, family room with fireplace and coffered ceiling, wood paneled home office/library, expansive lower level that features a recreation room with wet bar, 12-seat home theater, concession stand, home gym, a salon, and two three-car garages back on the main level. Outdoor features include a gated entrance, motor court, fountain, large front portico, upper and lower terraces, patio, two pergolas, swimming pool with spa and water fountain. 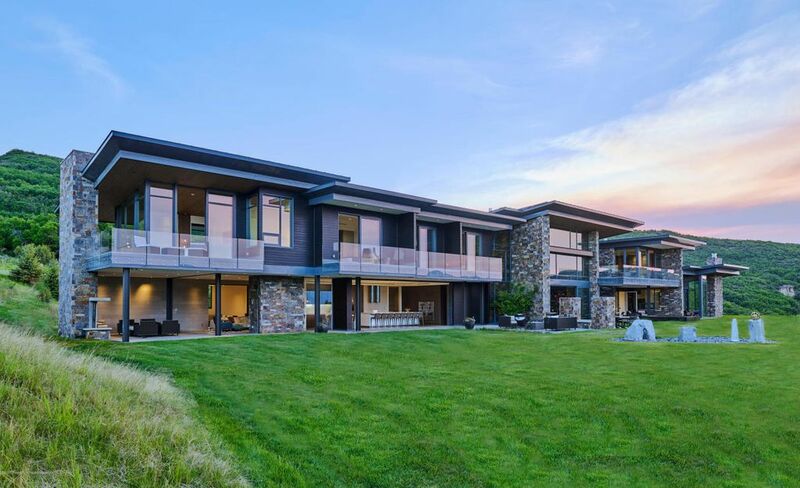 This newly built brick mansion in West Vancouver, BC, Canada is situated on an 0.39 acre of land and boasts stunning city and ocean views. 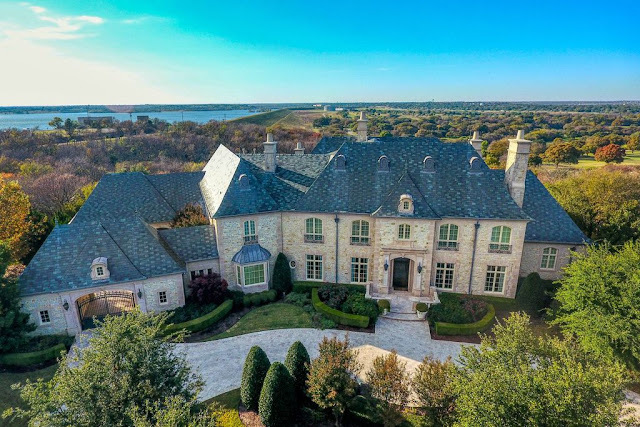 It features approximately 8,826 square feet of living space with six bedrooms, six full and one half bathrooms, two-story foyer with winding floating staircase, elevator, formal living room with fireplace, dining room, gourmet kitchen and separate wok kitchen and a breakfast area, family room with fireplace, and a home office. The lower level features a wine cellar, home theater, game room, gym, and sauna. The outdoor features include a front portico, rooftop terraces, water features, patio, and swimming pool with spa. 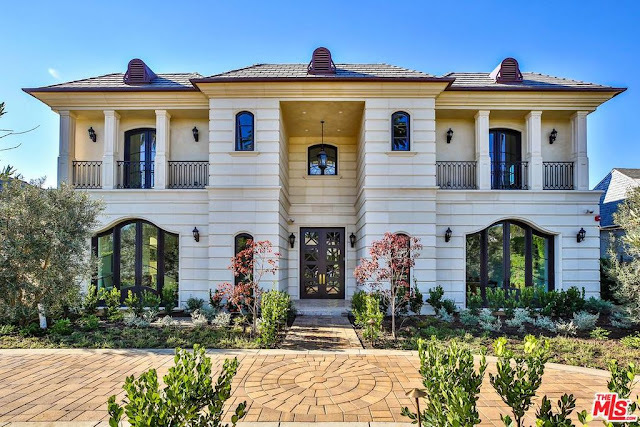 Built in 2008 and situated on 2.4 acres of land, this French-style stone mansion in Fort Worth, TX offers old-world charm on the outside and modern living elements on the inside. The stately home features approximately 12,268 square feet of living space with seven bedrooms, eight full and two half bathrooms, foyer and separate stair hall with floating staircase, elevator, formal living room with fireplace, formal dining room with built-in China hutch, butler's pantry, gourmet kitchen with brick pizza oven, two-story family room with fireplace, wood paneled library with fireplace, wood paneled home office (next to master suite), lower level recreation room with wet bar, a 3,000-bottle wine cellar, a three-car garage back on the main level and much more. Outdoor features include a gated porte-cochere, motor court, Juliet balconies, covered terraces, pergola, pool patio, and a swimming pool with spa. 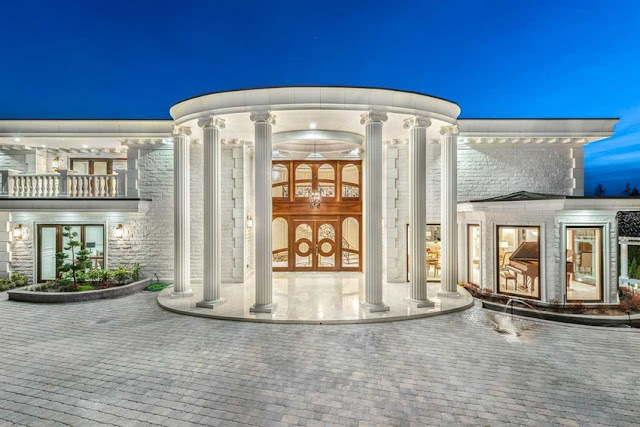 Fashioned after the villas of Europe's countrysides, this newly built stone mansion in Beverly Hills, CA is situated on 0.29 acres of land and features approximately 10,111 square feet of living space. It has six bedrooms, eight full and three half bathrooms, two-story foyer with floating staircase, an expansive living area that with two fireplaces and a Martini bar, formal dining room with wine closet, butler's pantry, gourmet kitchen with breakfast area, home office with fireplace, lower level glass-closed wine cellar, family room with wet bar, a 12-seat home theater, and much more. Outdoor features include a two-story covered front porch, front and rear upper terraces, covered rear patio with fireplace, BBQ kitchen, and a swimming pool. Drawing inspiration from the beautiful villas of Tuscany, this stone and stucco mansion in Paradise Valley, AZ was built in 2009 and situated on just over two acres of land with uninterrupted views of the Camelback mountain range. It features approximately 14,631 square feet of living space with eight bedrooms, nine bathrooms (the master bathroom includes a spa, steam shower, and exercise room access), foyer and gallery-style hallways, formal living room with fireplace, formal dining room with groin vault ceiling, butler's pantry, gourmet kitchen, breakfast room, family room with vaulted ceiling, fireplace, and wet bar, a home office/library, expansive game room with kitchenette, an eight-seat home theater, and two three-car garages. Outdoor features include a gated entrance, fountain, porte-cochere, motor court, loggia with fireplace and BBQ kitchen, open and covered patios, fire pit, swimming pool with spa, pavilion with fireplace, and a separate guest house. 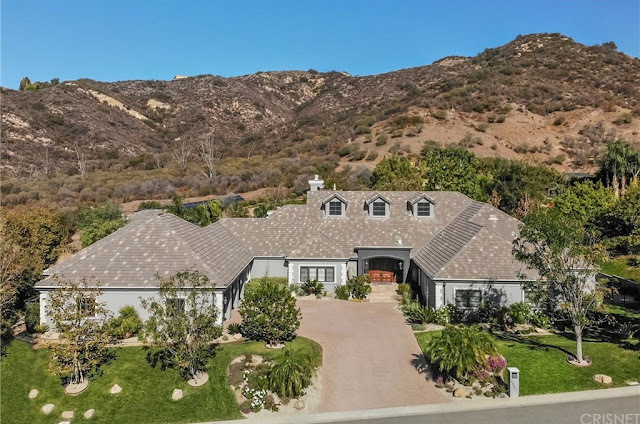 This ranch-style mansion in Calabasas, CA was built in 2005 and is situated on nearly 11 acres that boasts resort-like flair. It features approximately 8,487 square feet of living space with six bedrooms, nine bathrooms, great room with vaulted ceiling, fireplace, and wet bar, formal dining room, butler's pantry, gourmet kitchen with top-of-the-line appliances, breakfast area, family room with fireplace and media center, home office, wine cellar, 12-seat home theater, exercise room, and a three-car garage. Outdoor features include a motor court, front covered porch, lanai, a BBQ kitchen, gas fire pit, expansive patio, swimming pool with spa, basketball court, and a guest house. This stately brick Georgian-style mega mansion in Pikesville, MD was built in 2003 and is situated on just under two acres of land. It features approximately 20,375 square feet of living space with five bedrooms, seven full and three half bathrooms, two-story foyer with floating staircase, elevator, formal living and dining rooms with fireplaces, butler's pantry, gourmet kitchen with breakfast area, sun room, family room with media center and fireplace, mahogany library with fireplace, an expansive lower level recreation/game room with wet bar, a 15-seat home theater, home gym with sauna and spa areas, golf simulation room, and a three-car garage. Outdoor features include a gated entrance, motor court, terraces, pool patio, swimming pool and separate spa, putting green, and a pool house. 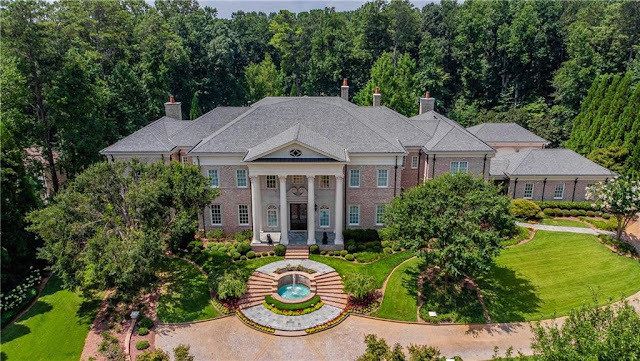 This French Normandy-style brick and stone mansion in Atlanta, GA was built in 2007 and is situated on just over an acre of land. It features approximately 16,344 square feet of living space with eight bedrooms, eight full and three half bathrooms, two-story foyer with staircase, elevator, formal living room with fireplace, formal dining room, butler's pantry, gourmet kitchen with double islands, family room with vaulted ceiling and fireplace, a home office with fireplace, upper level sitting room with fireplace, second home office with vaulted ceiling, expansive lower level with recreation room with media center, wet bar, wine cellar and tasting room, billiards room, an exercise room, and garage parking for four cars back on the main level. There is also an apartment above the garage with bedroom, bathroom, living space, and kitchen. Outdoor features include a gated entrance, porte-cochere, motor court, covered front porch, terrace with fireplace, loggia with BBQ kitchen, resort-style free form swimming pool with waterfall, separate spa, and formal gardens. Platinum Series Homes by Mark Molthan is one of North Dallas' premier builders. With superior craftsmanship at the forefront of their business model, Platinum collaborates with industry professionals and transforms distinct client visions into custom masterpieces. Over the years, they have won number awards from various organizations for their fine work. 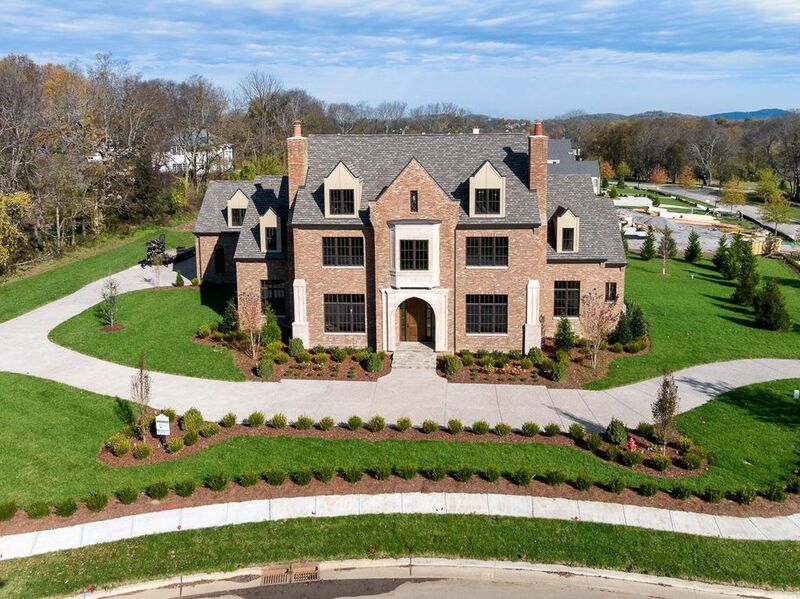 This French Country-inspired mega mansion in Naperville, IL was built in 2014 and is situated on just under three acres of rolling land. Clad in stucco and stone, the home features approximately 21,805 square feet of living space with six bedrooms, seven full and three half bathrooms, two-story foyer with floating staircase, elevator, formal living room with vaulted ceiling and fireplace, two-story great room with fireplace, butler's pantry, formal dining room, gourmet kitchen with breakfast bar, breakfast room, family room with fireplace, screened-in porch with fireplace, wood paneled home office with fireplace, an expansive lower level that includes a recreation room with fireplace, wet bar, billiards room, poker room, an eight-seat home theater, and an exercise room. The main level is completed with garage parking for eight vehicles. Outdoor features include a gated entrance, motor court, porte-cochere, front covered porch, balconies, patios, and a fire pit. A brick and stone home that was originally built in 1983 in Hidden Hills, CA, has been recently transformed into this one-of-a-kind modern masterpiece that boasts a wide open interior with an abundance of natural light by way of huge picture windows and disappearing glass walls. Situated on nearly two acres of land, the modernized mansion features approximately 11,805 square feet of living space with seven bedrooms, seven full and two half bathrooms, foyer with high ceiling, living room with fireplace, formal dining room with two glass-enclosed wine closets, butler's pantry, chef's kitchen with stainless steel appliances and large waterfall island, breakfast room, family room with wet bar and fireplace, a study, game room with vaulted ceiling, home theater, mirrored exercise/massage room, spa with sauna and steam shower, two large upper level bonus rooms, a four-car garage, and more. Outdoor features include a porte-cochere, motor court, guest house with bedroom, bathroom, kitchen and living space, a dining pavilion with BBQ kitchen, an infinity-edge swimming pool with spa and lighted waterfall, expansive patios, sunken fire pit area, and a sport court. 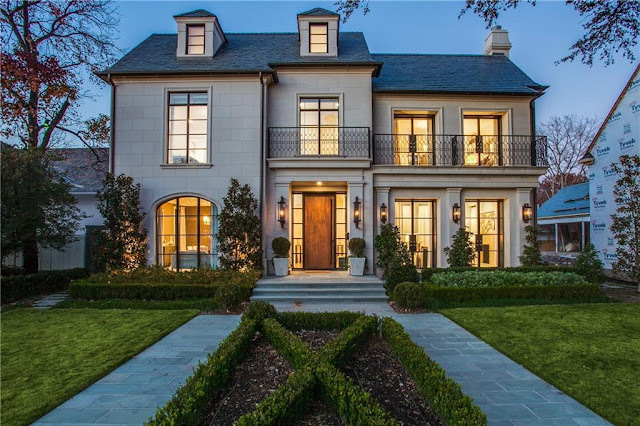 This Transitional-style stone mansion was built in 2017 and is situated on a narrow lot on prestigious Beverly Drive in Dallas, TX. It features approximately 10,282 square feet of living space with six bedrooms, six full and two half bathrooms, formal living room with fireplace, formal dining room, butler's pantry, gourmet kitchen with breakfast bar, separate breakfast area opening to family room with fireplace, a den with fireplace located off of the kitchen, a wet bar that opens to the outside, an upper level recreation room, and flex space on the third floor. The rear-loading two-car garage features a lift that provides access to an underground garage that can accommodate an additional six cars. Outdoor features include a balcony, a courtyard, and a covered patio with phantom screens. Boasting breathtaking views of Manchester's skyline, this Colonial-style mansion in Bedford, NH was built in 1997 and is situated on nearly three acres of land. It features approximately 9,602 square feet of living space with four bedrooms, four full and one half bathrooms, foyer with two-story stair tower and floating staircase, formal living room with fireplace and barrel vault ceiling, formal dining room, chef-inspired kitchen with large island, breakfast room, family room with stone fireplace, and a home office. The finished lower level includes a recreation room, 10-seat home theater, kitchen, and exercise room. The three-car garage with two lifts is located on the main level. Outdoor features include a motor court, front cover porch, decks, patios, swimming pool with spa, and a garden. 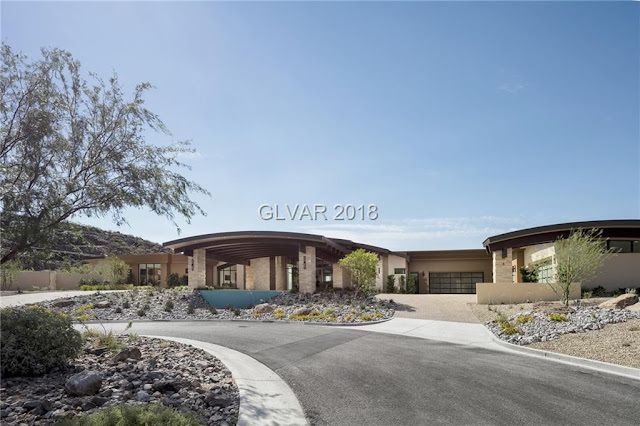 Another breathtaking contemporary-style mansion out of Henderson, NV that is newly built and situated on two acres of land with views of the not-so-distant Las Vegas cityscape! With an abundance of indoor/outdoor spaces by way of disappearing glass walls, 'Villa Azul' is a Sun West Custom Homes-designed masterpiece that features approximately 12,101 square feet of living space. 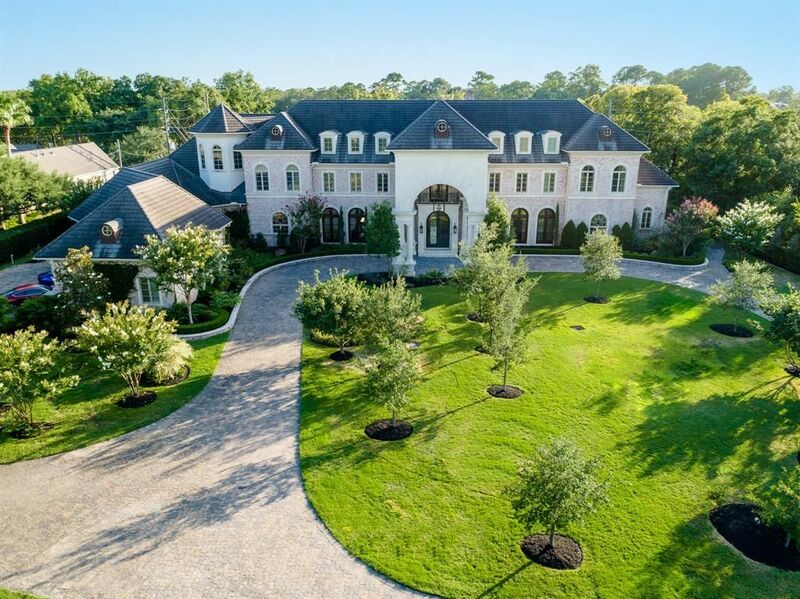 It has six bedrooms, six full and two half bathrooms, a great room with vaulted ceiling and fireplace, formal dining room with glass-enclosed wine closet, gourmet kitchen with double islands, breakfast room, home office, billiards room, a 12-seat home theater, garage parking for six cars, and much more. Outdoor features include a porte-cochere, motor court, front water fountain, patios, loggia, BBQ kitchen, and a 5,900 square foot infinity-edge swimming pool with spa, swim up bar, and a sunken fire pit. There is also a half-court basketball court and a putting green. 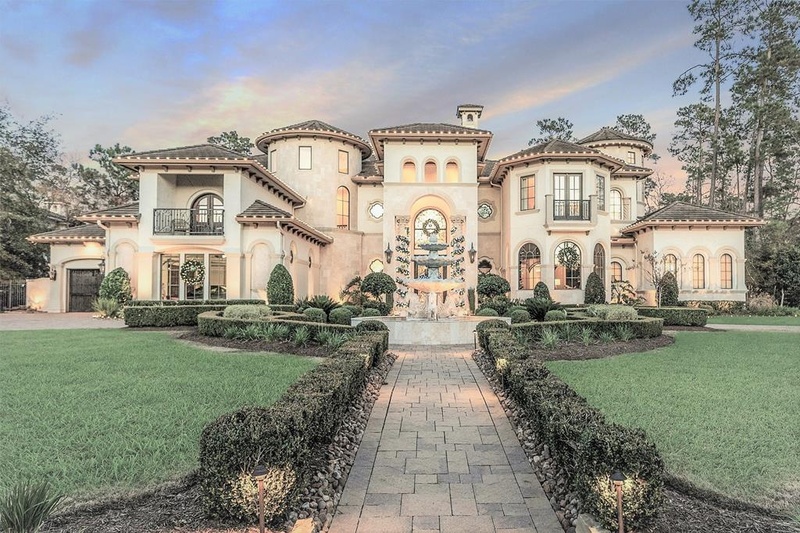 This stone and stucco Mediterranean-inspired mansion in The Woodlands, TX was built in 2011 and is situated on an acre of land with views of the 11th and 12th holes of the Tom Fazio championship golf course. It features approximately 10,958 square feet of living space with six bedrooms, seven full and two half bathrooms with a gallery-style foyer and winding staircase, elevator, wet bar and wine room, two-story great room with fireplace, formal dining room, butler's pantry with wine closet, gourmet kitchen, breakfast room, family room, wood paneled home office, an expansive upper level recreation room with kitchen, an eight-seat home theater, study room, and a four-car garage. Outdoor features include a fountain, motor court, covered front porch, balconies, upper terrace, loggia with fireplace and BBQ kitchen, patio, swimming pool with spa, and a sport court. For more than 20 years, James McDonald has been designing award-winning custom homes and mega mansions. His firm, JMA Architects has been providing a range of services that cover the Washington, DC area as well as New York, New Jersey, Delaware, West Virginia, Pennsylvania, and North Carolina. The firm also specializes in renovations as well as multi-family. See some of JMA Architects' mansions below. Dubbed 'Elysium', this recently completely mountain mansion in Aspen, CO is situated on 36 acres of land and boasts an abundance of indoor-outdoor living spaces by way of disappearing glass walls. Designed by Aspen's Z Group Architects, the contemporary showpiece features approximately 10,603 square feet of living space with six bedrooms, seven full and two half bathrooms, a two-story stair hall with an estimated $200,000 glass staircase, great and dining rooms that sit seamlessly connected under a two-story 27' tall ceiling, kitchen with large center island, breakfast area, indoor/outdoor family room with fireplaces, media room, a three-car garage, and much more. Outdoor features include a motor court, front and rear water features, patios, balconies, dining area, a custom spa, and an expansive sky deck above the garage. 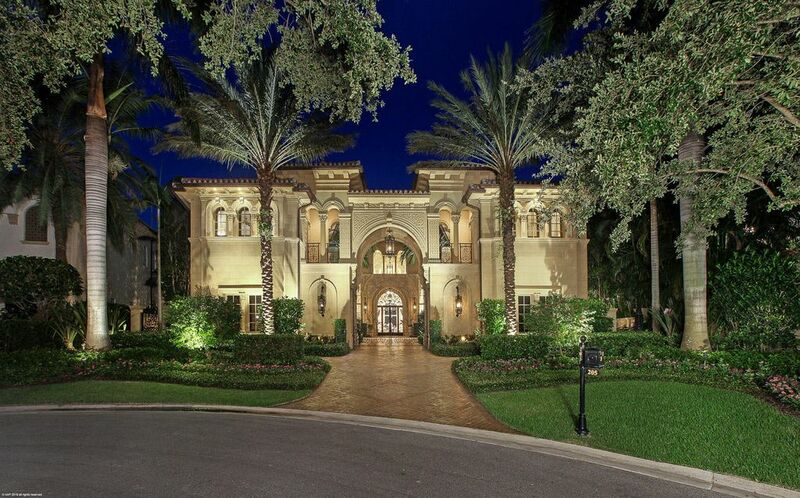 This European-inspired mansion in Palm Beach Gardens, FL was built in 2010 and is situated on an acre of land that offers expansive golf course views. It features approximately 11,654 square feet of living space with five bedrooms, six full and three half bathrooms, a gallery leading to a two-story stair hall and winding staircase, elevator, formal living room with fireplace, formal dining room, gourmet kitchen with marble and onyx surfaces, breakfast room, family room with vaulted ceiling, his and hers home offices, exercise room, four-car garage, one-bedroom guest house, and much more. Outdoor features include a motor court with fountain, terraces, loggia with vaulted ceiling and fireplace, kitchen, patio, and a swimming pool with spa. 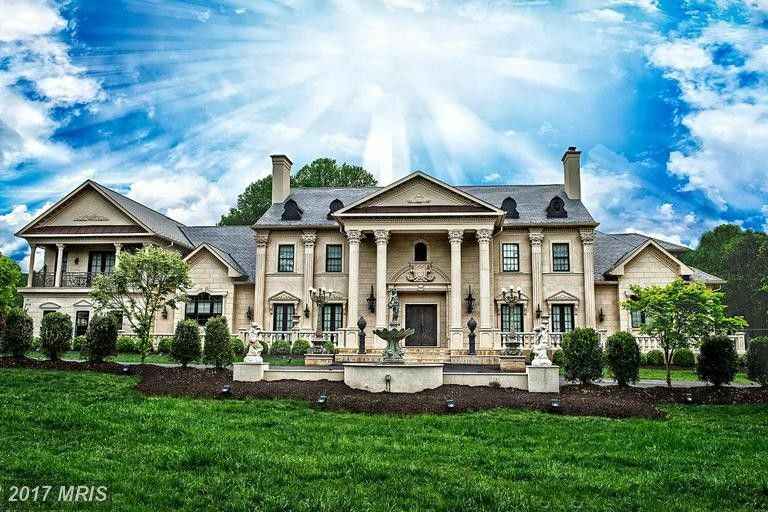 This stone and stucco French Provincial-style mansion in Rougemont, NC was built in 2008 and sits proudly on 120 acres of land. It features approximately 15,937 square feet of living space with seven bedrooms, nine full and three half bathrooms, two-story foyer with floating double staircase, formal living room, two-story great room with fireplace, formal dining room with fireplace, butler's pantry, gourmet kitchen with breakfast area, rear staircase, family room with fireplace, paneled home office with fireplace, recreation room with wet bar, game room, 10-seat home theater, home gym, two three-car garages, and much more. Outdoor features include a gated entrance, motor court, formal garden with fountain, front and rear covered porches, expansive patio, pavilion with fireplace, swimming pool with deck jets, pool house, and a fish pond. Built in 2009 using the highest quality steel framing and concrete, this stately mansion in Oakville, ON represents the finest in Neoclassical-style architectural design. Situated on an acre of finely manicured land, the Canadian home features approximately 16,000+ square feet of living space with five bedrooms, six full and two half bathrooms, column-lined foyer, two-story stair hall with floating staircase, elevator, formal living and dining rooms, two-story great room with two fireplaces, gourmet kitchen with double islands and breakfast area, family room, billiards room with fireplace and wet bar, home office/library with fireplace, 14-seat home theater, 500-bottle wine cellar, 12'x40' indoor swimming pool, home gym with spa, three-car garage with hydraulic lift, and much more. Outdoor features include two gated entrances, motor court, expansive rear portico, patio, formal garden, and sculpture fountains. 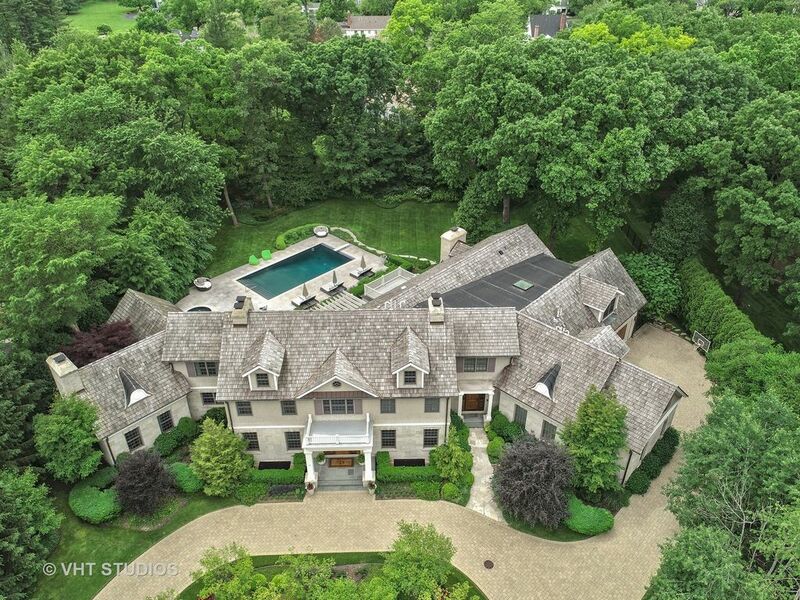 This shingle and stone mansion in Northfield, IL was built in 2006 and situated on just over one acre of land surrounded by trees that provide natural privacy. It features approximately 10,555 square feet of living space with six bedrooms, six full and four half bathrooms, two-story foyer with staircase, formal living room with fireplace, formal dining room, butler's pantry, gourmet kitchen with top-of-the-line appliances and breakfast bar, breakfast room, family room with fireplace, home office with fireplace and vaulted ceiling, and a four-car garage. The expansive lower level includes a recreation room with fireplace, billiards room, wet bar, wine cellar, home gym, and a golf simulation room. Outdoor features include a covered front porch, screened-in porch, balcony, BBQ station, fireplace, patio, swimming pool and separate spa. Designed by Luxury Living Design Group, this recently completed limestone mega mansion in McLean, VA is situated on two acres of land. The finely crafted home features approximately 20,000 square feet of living space with eight bedrooms, nine full and two half bathrooms, a two-story foyer with floating double staircase, elevator, formal living room with fireplace, two-story great room with fireplace, music room, formal dining room, butler's pantry, Habersham gourmet kitchen with coffered ceiling, breakfast room, two-story family room with fireplace and built-ins, paneled home office, expansive lower level with formal living rooms with fireplaces, billiards room, home theater, wine cellar, cigar room, indoor 12-person spa, and a four-car garage back on the main level. Outdoor features include a portico, front and rear terraces, patio, cabana, swimming pool, and fountains. 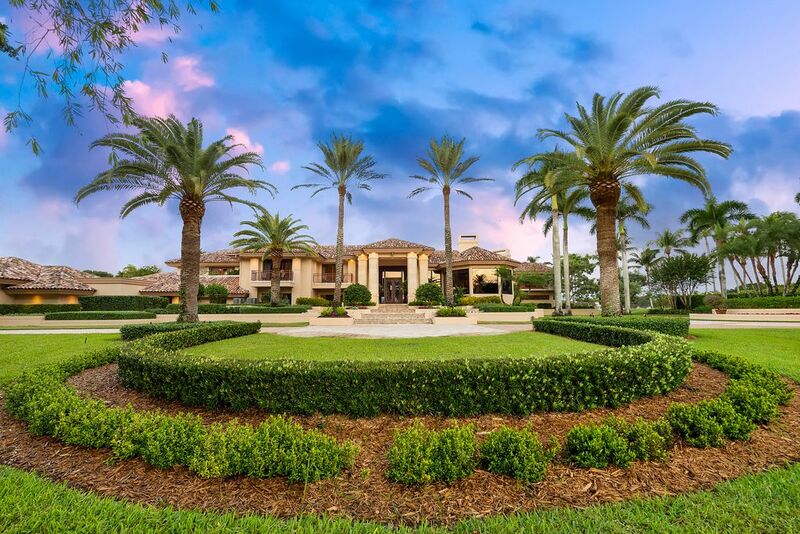 This beautiful coastal-inspired mansion in Palm Beach Gardens, FL was built in 2015 and is situated on just over an acre of land with golf course and water views. It features approximately 9,805 square feet of living space with five bedrooms, six full and two half bathrooms, two staircases, two-story great room with fireplace, formal dining room, gourmet kitchen with stainless steel appliances and aquarium, breakfast room, his and her home offices, lounge with fireplace and wine coolers, billiards/game room, home theater, exercise room, and a five-car garage. Outdoor features include gated motor court, covered front porch with water features, balconies, terraces, loggia with BBQ kitchen and fireplace, and a resort-style infinity-edge swimming pool with spa, fire bowls, and sun bathing platforms. 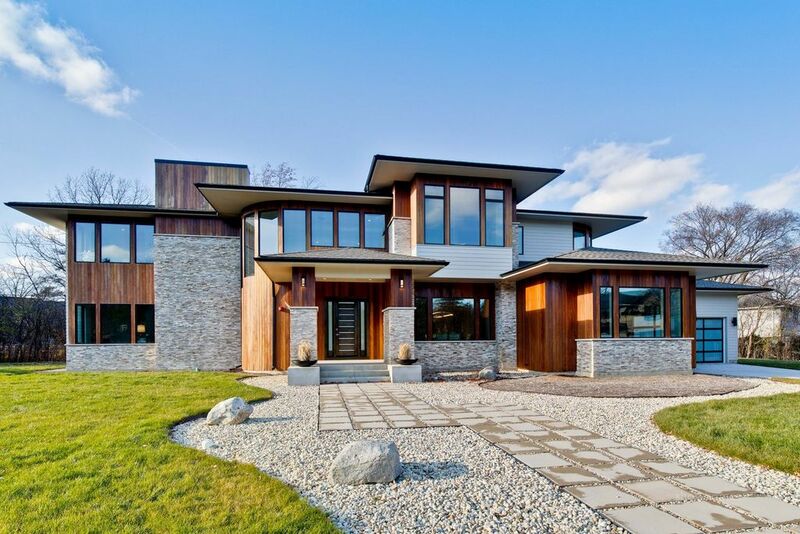 Fashioned after the works of Frank Lloyd Wright and modernized to meet today's standards, this newly built contemporary-style mansion in Northbrook, IL is situated on a small corner lot surrounded by nearby shops, dining, trains, and highway. It features approximately 8,410 square feet of living space with five bedrooms, six full and one half bathrooms, two-story foyer with staircase, two-story great room with fireplace, formal dining room with butler's pantry, kitchen with quartz island and stainless steel appliances, breakfast room, den, garage parking for three cars, and an expansive lower level with lounge with wet bar, game area, exercise room, home theater, and a conservatory. Outdoor features include a covered front porch, patio, and outdoor living area with fireplace. This newly completed contemporary-style mansion in Atherton, CA is situated on just over an acre of land in the coveted Menlo Circus Club area. Clad in blackened stainless steel, stone, and cedar, the home features approximately 13,014 square feet of living space with seven bedrooms, eight full and four half bathrooms, two-story foyer with floating vertebrae staircase, elevator, formal living and dining rooms, butler's pantry, gourmet kitchen with double islands, breakfast nook with bar, family room with fireplace, library, an expansive lower level with lounge, billiards and game room with wet bar, glass-enclosed wine closet, home theater, exercise room with spa bath, massage room, and a two-car garage back on the main level. Outdoor features include a motor court, carport, breezeway, detached two-car garage, loggia, veranda with BBQ kitchen, balconies, lower level patio, and a swimming pool. 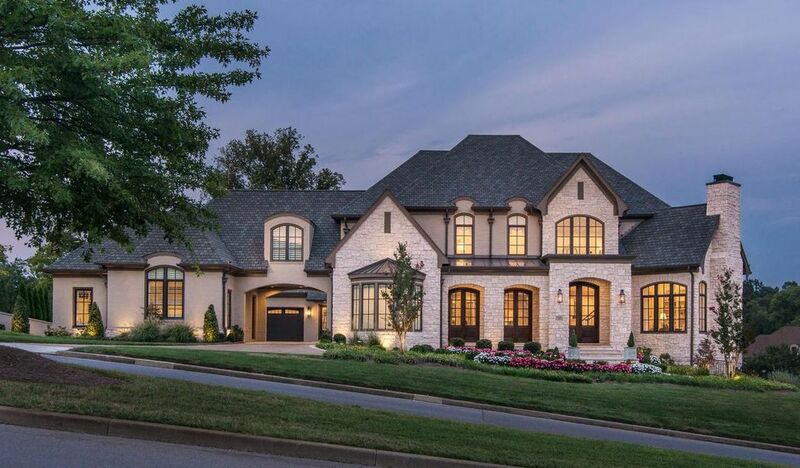 This Jack Herr-designed newly built brick mansion in Brentwood, TN is situated on an acre of land and features approximately 8,035 square feet of living space. It has five bedrooms, five full and one half bathrooms, two-story foyer with winding staircase, elevator, formal living and dining rooms with fireplaces, butler's pantry, kitchen with stainless steel appliances, breakfast room, family room with fireplace, recreation room with vaulted ceiling, a four-car garage, and much more. Outdoor features include a rear covered porch with fireplace. Inspired by the estates of the wealthy families of the Gilded Age, this newly built stone mansion in Tarrytown, NY is situated on nearly three acres of land with Hudson River views. It features approximately 18,359 square feet of living space with nine bedrooms, 11 full and three half bathrooms, two-story reception hall with winding staircase, formal and dining rooms with fireplaces, butler's pantry, gourmet kitchen with stainless steel appliances, family room with fireplace, two-story mahogany library, lower level indoor basketball court, second kitchen, home theater, wine cellar, and a three-car garage and guest wing back on the main level. Outdoor features include a motor court, 5,751 square feet of porches and terraces, and a geothermal HVAC green house. 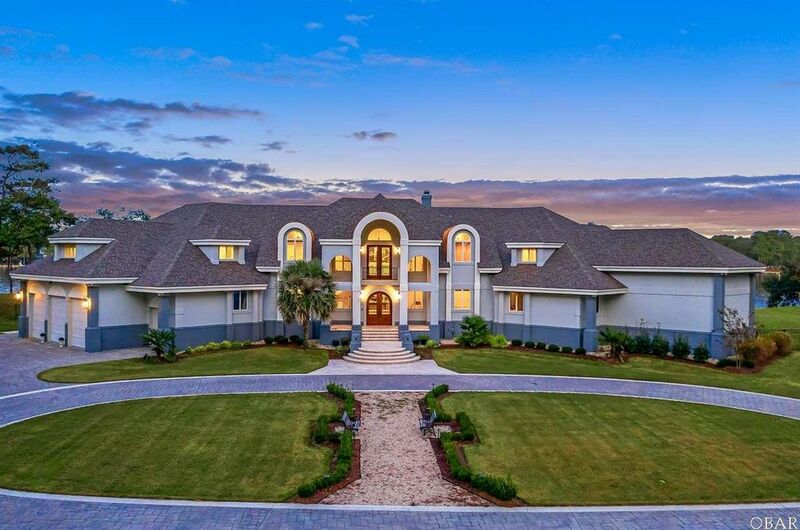 This stately mansion on 190' of direct intracoastal water frontage was built in 2010 and is situated on just over a half acre of land. Located in Jupiter, FL, the Mediterranean-style home features approximately 13,240 square feet of living space with seven bedrooms, nine full and two half bathrooms, two-story foyer with staircase, elevator, two-story great room with fireplace, two-story dining room with dome ceiling, gourmet kitchen with double islands, breakfast room, family room with media center and bar, a paneled gentleman's office with fireplace and wet bar, upper level sitting room, home gym with steam shower, sauna, and therapy spa, home theater, garage parking for eight cars, and much more. Outdoor features include a gated entrance, motor court, covered front porch, balconies, loggia with kitchen and drop-down screens, covered and open patios, terraces, swimming pool with spa, and boat dock. The property also includes two separate guest houses with private entrances. Looking at the polished exterior and interiors, it is hard to believe that this fine home in Brentwood, TN is just about 10 years old; it is definitely holding its age very well. 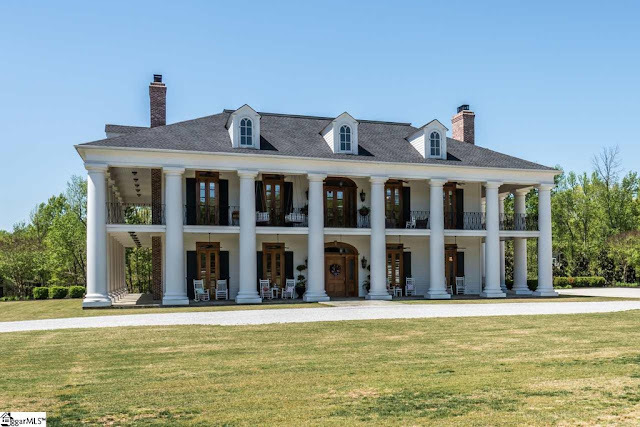 The French-style mansion was built in 2009 and is situated on just over an acre of land with pond views. It features approximately 8,604 square feet of living space five bedrooms, five full and two half bathrooms, two-story foyer with separate stair hall and staircase, elevator, formal living and dining rooms, butler's pantry, gourmet kitchen with stainless steel appliances, breakfast nook, rear staircase, family room with vaulted ceiling and fireplace, main and upper level offices/libraries, media room, craft room, a screened-in porch, and a four-car garage. Outdoor features include a motor court, patios, covered porch, swimming pool with spa, and a separate guest/pool house with room for six. This Georgian-style mansion in Duluth, GA was built in 2005 and is situated on just under an acre of land with TPC Sugarloaf golf course views. Boasting a dash of European-inspired flair, it features approximately 11,377 square feet of living space with five bedrooms, six full and three half bathrooms, two-story foyer with double floating staircase and painted dome ceiling, two-story great room with fireplace, formal dining room, butler's pantry, gourmet eat-in kitchen with planning area, breakfast room, family room with vaulted ceiling and fireplace, an expansive lower level that includes a family room with fireplace, wet bar with cooler, game area, media room, seven-seat home theater, and a home gym. A three-car garage completes the main floor. Outdoor features include covered front porch, Juliet balconies, terrace, covered porch, patio, and a swimming pool with spa and deck jets. 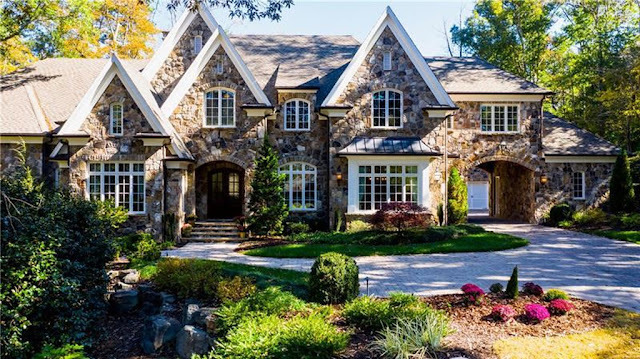 This newly built mansion in Old Westbury, NY is clad in brick and stone accents and situated on five private acres of land. Spread over three floors, it features approximately 16,000 square feet of living space with six bedrooms, seven full and one half bathrooms, two-story foyer with bridal staircase and Wainscot paneled walls, elevator, formal living and dining rooms with fireplaces, butler's pantry, gourmet eat-in kitchen with stainless steel appliances, breakfast space sharing a two-sided gas fireplace with family room, expansive walkout lower level with recreation room, wet bar, wine cellar, 11-seat home theater, and an exercise room. There is a four-car garage back on the main level. Outdoor features include a gated entrance, motor court, covered front porch with two-story columns, front terraces, Juliet balconies, koi pond, patio, swimming pool with spa and swim up bar, and a pavilion. 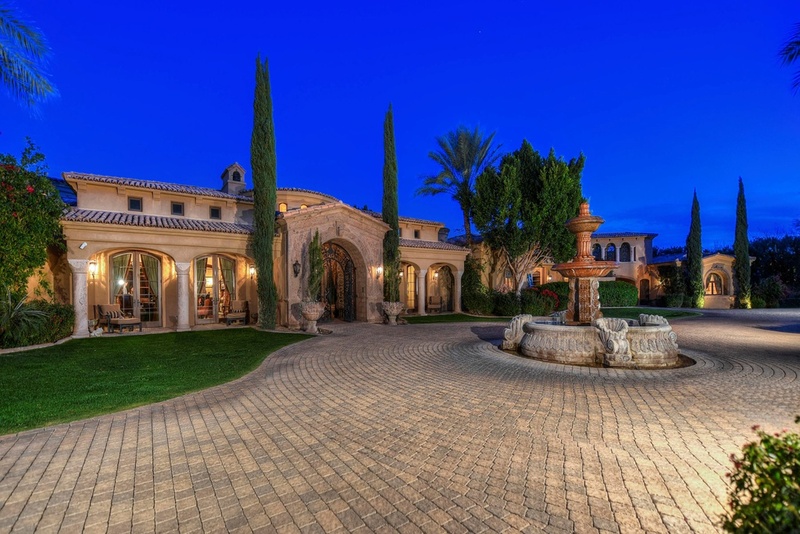 The paint on the interior walls of this newly built European-inspired mansion in Mesa, AZ are barely dry! Situated on just under two acres of land, the brick home is a blend of traditional architecture and modern finishes. It features approximately 10,076 square feet of living space with six bedrooms, eight bathrooms, two-story foyer with winding staircase, formal dining room with fireplace, butler's pantry, an exquisite kitchen with top-of-the-line stainless steel appliances, breakfast area, family room with vaulted ceiling and fireplace, home office/library, an expansive upper level recreation room with kitchen, a three-car garage, and much more. Outdoor features include a motor court, front courtyard with fountain, front and rear balconies, gated detached three-car garage, roof top deck, breezeway with fireplace, patios, and a swimming pool with spa and deck jets. There is also a pool house with bedroom, kitchen, and living area with fireplace. Former Cleveland Cavalier's coach Tyronn Lue is looking to unload his four-sides brick mansion in Bay Village, OH. The home was built in 2006 and situated on 1.7 acres of land fronting Lake Erie. Stately with modern flair, it features approximately 14,000 square feet of living space with five bedrooms, six full and three half bathrooms, foyer with spiral staircase, formal living room, two-story great room with fireplace and media center, dining room with sitting area, butler's pantry, gourmet kitchen with double islands and top-of-the-line stainless steel appliances, breakfast room, home office with fireplace, an observation loft, expansive lower level recreation room with second kitchen, home theater, a fully equipped home gym, a four-car garage, and much more. Outdoor features include a gated entrance, motor court, a front covered porch, terraces, patios, an enclosed sun room, and a tennis court. 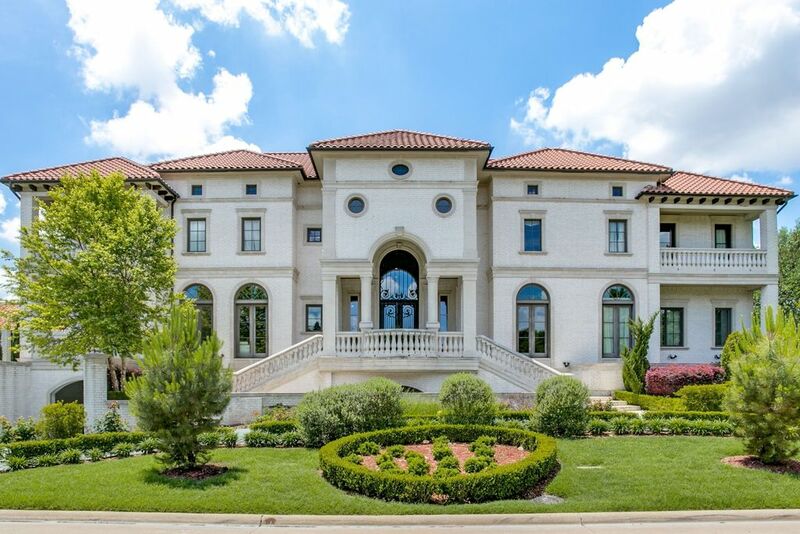 This brick and stone-accented mansion in Irving, TX was built in 1999 and overlooks the 16th hole of the Four Seasons Cottonwood Valley Golf Course. Situated on 0.79 acres of land in a guard-gated community, the French-inspired home features approximately 10,157 square feet of living space with four bedrooms, four full and four half bathrooms, two-story foyer with grand double staircase, formal living room with fireplace, two-story paneled great room with fireplace, formal dining room, butler's pantry, gourmet kitchen with stainless steel appliances, paneled home office/library, loft, home theater, exercise room, two two-car garages, and much more. Outdoor features include a motor court, front covered porch, rear patio, and a free form swimming pool. 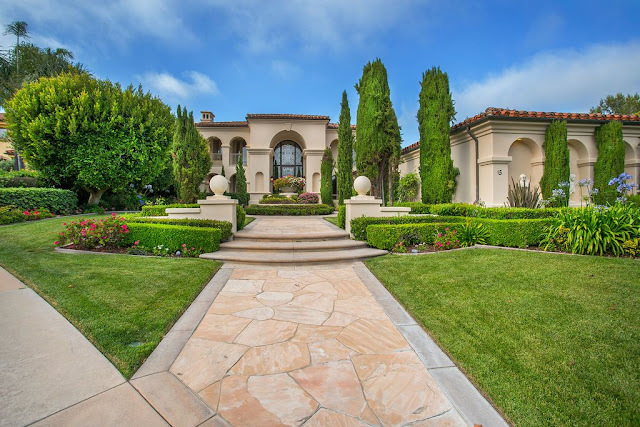 Located in the prestigious guard-gated Pelican Crest community in Newport Coast, CA, this Mediterranean-style mansion was built in 1996 and is situated on 0.68 acres of raised land affording it spectacular panoramic views. It features approximately 9,547 square feet of living space with five bedrooms, five full and two half bathrooms, two-story rotunda-style foyer with sweeping staircase, two-story great room with fireplace and wet bar, formal dining room with built in serving station, butler's pantry, gourmet kitchen with double islands, family room with fireplace and built in media center, home office with fireplace, media room, four-car garage, and much more. Outdoor features include a front courtyard, covered front porch, terraces, patios, and swimming pool with spa. This stately brick mansion in Brentwood, TN was built in 2016 and is situated on about three quarters of an acre of land overlooking the neighboring golf course's 18th tee box. It features approximately 12,544 square feet of living space with six bedrooms, seven full and three half bathrooms, two-story foyer with staircase, elevator, formal living room with fireplace, formal dining room, butler's pantry, chef-inspired kitchen, breakfast area, family room with vaulted ceiling and fireplace, study with vaulted ceiling and fireplace, lower level recreation room, wet bar, poker room with fireplace, exercise room, indoor basketball court, batting cage, and garage parking for six cars back on the main level. Outdoor features include a porte-cochere, motor court, covered front porch, expansive screened-in porch with fireplace, patio, and a free form swimming pool with spa and deck jets. This waterfront mansion in Kitty Hawk, NC was built in 1989 but completely renovated between 2014 and 2016 to complement modern standards. It is situated on just four acres of land with waterfront and seasonal golf course views. It features approximately 14,059 square feet of living space with six bedrooms, eight full and one half bathrooms, foyer with winding staircase, elevator, two-story great room with fireplace, formal dining room with barrel vault ceiling, gourmet kitchen with breakfast bar island, lower level family room with fireplace and wet bar, an indoor pool, an indoor basketball court, a home theater, three-car garage, and much more. Outdoor features include a motor court, front covered porch and balcony, an additional balcony, an expansive patio, swimming pool, and a private dock. An exceptional home that truly exemplifies the definition of indoor/outdoor living! 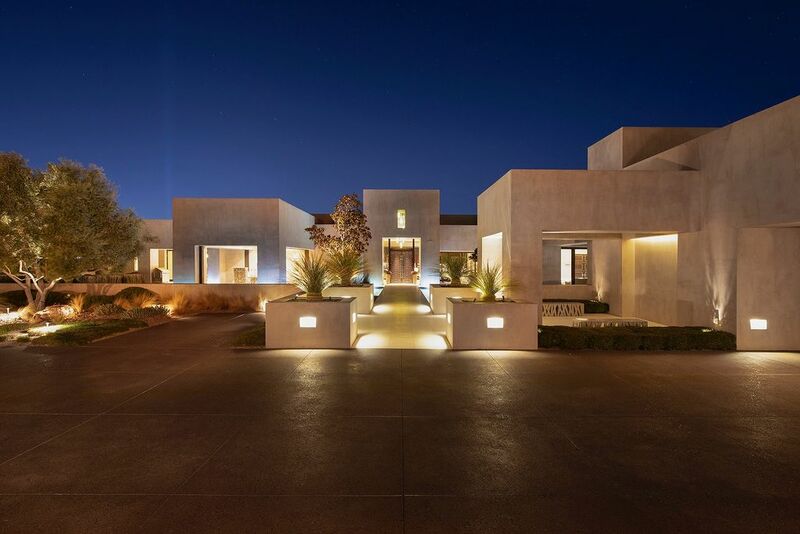 Built in 2010 and situated on just over two acres of land, this contemporary-style architect-designed mansion in Henderson, NV boasts peerless views of the Las Vegas Strip and neighboring mountain ranges. It features approximately 17,562 square feet of living space with five bedrooms and five full and five half bathrooms. Notable interior spaces include a two-story foyer with stone staircase, wine cellar underneath the staircase, an elevator, great room with wet bar, fireplace, and roll up door, formal dining room on the water, expansive chef-inspired kitchen with breakfast bar, butler's pantry, family room, home office on the water, game room with wet bar, 12-seat home theater, and an exercise room with massage and spa areas. Two separate garage areas provide parking for up to five cars. Outdoor features include a gated entrance, motor court, reflection pools, covered and open patios, terraces, fireplace, infinity-edge swimming pool, separate spa, and a lounge pit. Founded in 1991 by Utah native Michael Upwall, the firm that carries his name specializes in the design of the self-described "Mountain Craftsman" homes. Upwall Design Architects in Salt Lake City uses its knowledge of the area's topography, climate, and geography to bring to life homes that are the representation of the natural beauty that surrounds them. 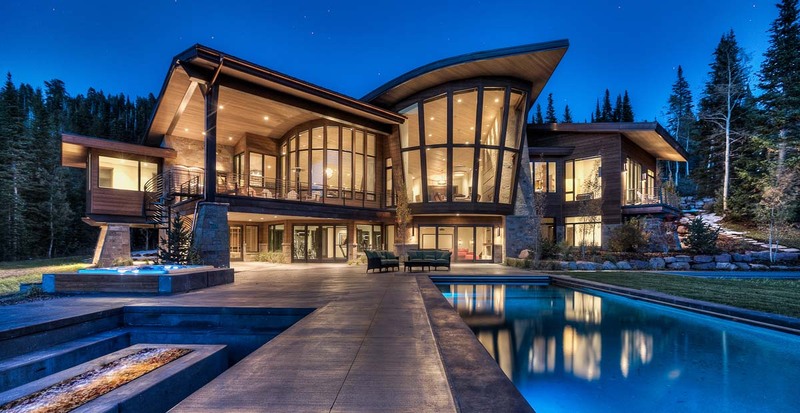 Take a look at some of their cutting-edge mountain mansions below. 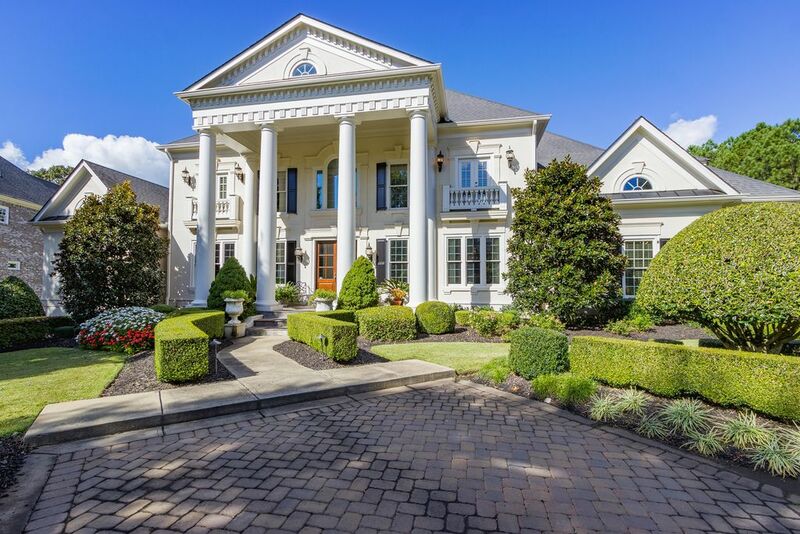 Located about half an hour outside of Nashville and madeover in 2012, this brick and stone-accented mansion in Nolensville, TN was built in 2000 and is situated on 15 acres of fenced and manicured land. Boasting an open floor plan, it features approximately 10,668 square feet of living space with six bedrooms, six full and two half bathrooms, foyer with winding staircase, formal living room with fireplace, study with fireplace, dining room, butler's pantry, chef-inspired kitchen with breakfast bar, breakfast room, sun room with fireplace, family room with fireplace, expansive wine cellar, 10-seat home theater, two two-car garages, and much more. Outdoor features include a gated entrance, motor court, covered porches, court yard, rear portico, terrace, gazebo, and a swimming pool. This stately lakefront mansion in Sugar Land, TX was built in 2009 and is situated on 2.61 acres of land. Clad in brick and limestone, the French-style home features approximately 11,306 square feet of living space with five bedrooms, seven full and three half bathrooms, two-story foyer with floating curved staircase, two-story living room with fireplace, formal dining room, wet bar, butler's pantry, gourmet kitchen with stone countertops, breakfast room, family room with fireplace, paneled home office, upper level game room with wet bar, home theater, four-car garage, and much more. Outdoor features include a gated entrance, motor court, porte-cochere, loggia with fireplace and BBQ kitchen, covered and open patios, garden with fountain, fire pit, and an infinity-edge swimming pool with spa. 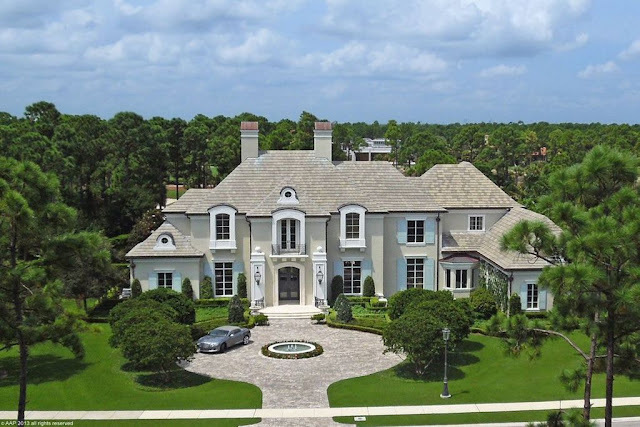 This waterfront mega mansion in Boca Raton, FL was built in 1995 and is situated on 6.4 acres of land. The Mediterranean-inspired home dubbed "The House of Peace" features approximately 41,010 square feet of living space with seven bedrooms, 10 full and nine half bathrooms, two-story foyer with floating staircase, elevator, two-story great room, family room with vaulted ceiling, paneled home office/library, wine cellar/tasting room, paneled lounge with wet bar, recording studio, seven-car garage, and much more. Outdoor features include motor courts, covered front porch, balconies, terraces, open and covered patios, swimming pool with spa, pavilion, and a tennis court. 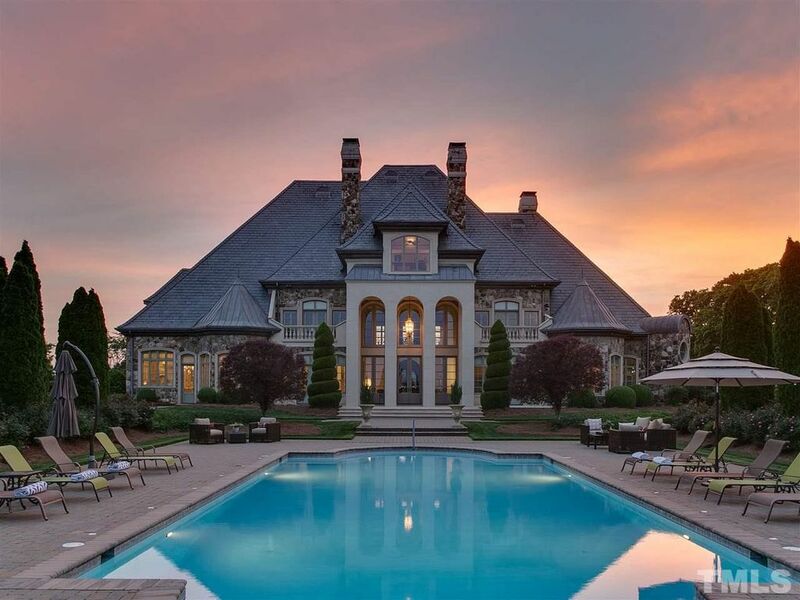 Built in 2007 and situated on six acres of land, this European-inspired mansion in Waxhaw, NC is a true representation of sophistication and superior craftsmanship. It features approximately 9,828 square feet of living space with six bedrooms, seven full and two half bathrooms, two-story foyer with staircase, formal living room with fireplace, formal dining room with nearby butler's pantry and wine closet, gourmet kitchen with stainless steel appliances, breakfast room, family room with vaulted ceiling and fireplace, paneled home office with box ceiling and fireplace, lower level billiards room with wet bar, card room, home theater, home gym, and garage parking for four cars on the main level. Outdoor features include a motor court, fountain, porte-cochere, gated covered front porch, front and rear Juliet balconies, upper and lower terraces, upper and lower patios, free form swimming pool with spa/waterfall feature and bridge, and a fire pit. 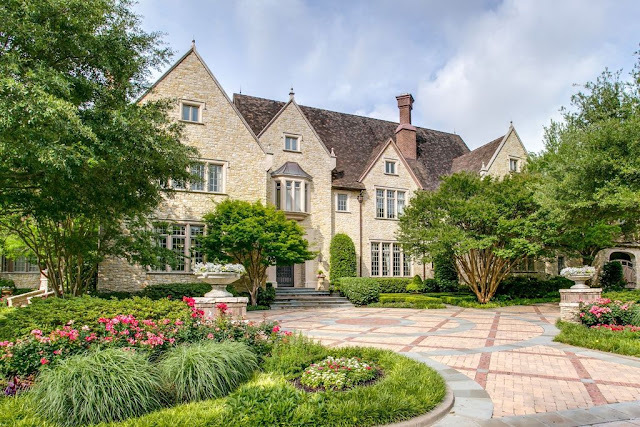 Designed by Fusch Architects and built in 2007 by Bob Thompson Homes, this stately stone mansion in Dallas, TX is situated on 0.88 acres of heavily wooded land and exudes regal European flair. The main house and guest quarters feature a combined 13,995 square feet of living space with five bedrooms, six full and three half bathrooms, a two-story foyer with U-shaped floating staircase, elevator, formal living room with fireplace and paneled ceiling, formal dining room with fireplace, butler's pantry, gourmet kitchen with breakfast bar, breakfast/family room with fireplace and cathedral ceiling, two-story paneled library with fireplace and 35-foot ceiling, game room with fireplace and cathedral ceiling, upper level media/play room and exercise room, expansive lower level with dining lounge with wet bar, wine cellar, and home theater, garage parking for four cars, and much more. Outdoor features include a motor court, porte-cochere, covered front porch, loggia with BBQ kitchen and fireplace, patio, swimming pool with deck jets, koi pond with fountains and bridge, a fire pit, and a fireplace-facing spa.